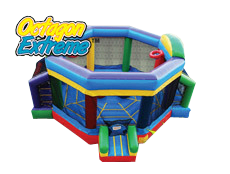 This is the ultimate game inflatable, it has joust, basketball, and kick balls goals as well as a giant jump area.... Welcome to the OCTAGON!!!!! !